Buy Organica Hazelnut Nougat Delight Snack Bar - 40g in the UK from our online shop or directly from our independent Scottish store. A delicious dark chocolate snack bar with a tasty hazelnut and nougat filling! This vegan chocolate snack bar is made with organic ingredients. Delicious combination of hazelnut and nougat covered in vegan dark chocolate. Great vegan snack for on the go or just when you feel you need a chocolate boost! We sell real Organica and other Chocolate directly from our shop in Scotland and online throughout the UK. View more products from Organica. Where can you buy real Organica Hazelnut Nougat safely online? If you are wondering where you can buy Organica Hazelnut Nougat Delight Snack Bar - 40g safely online in the UK, then shop with us. 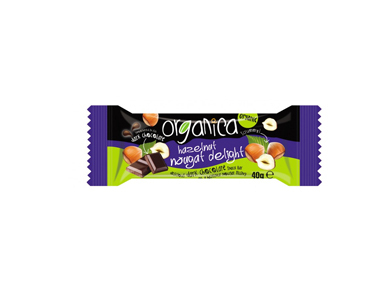 Organica Hazelnut Nougat - Organica Hazelnut Nougat Delight Snack Bar - 40g in Chocolate and Confectionery.